"Fashion always tends to change and modernize, but Indians are still traditionalists at heart, preferring to don ethnic wear on occasions, festivals and weddings. 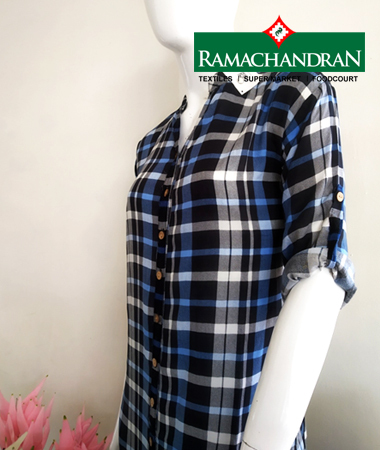 There is a high demand for everyday clothes for the working women. 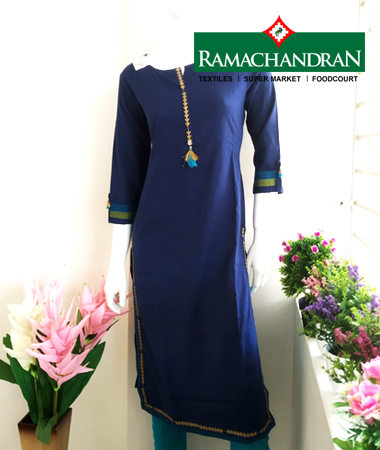 Indo western formal wear like Tail cut kurtas, Asymmetric kurtas, Cold shoulder Kurtas, Jacket kurtas, Shirt style kurtas etc is in high demand which can be worn by women of all ages, Its Stylish and chic, the clothes have been designed for the Indian weather and office. 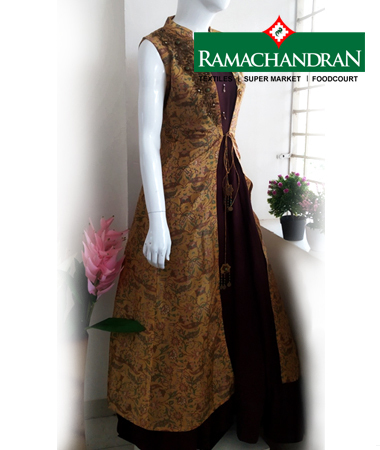 Also there is high demand for maternity kurtas, We keep all the latest collections for a rich shopping experience." 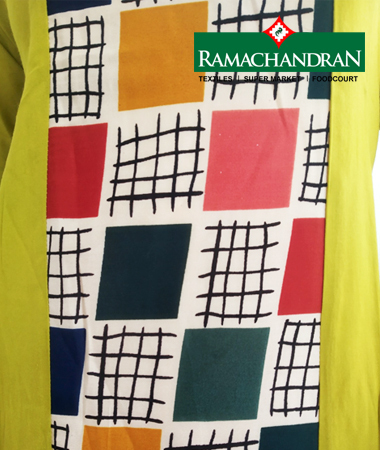 Says Mr. Donald Vincent, Floor Manager of Ramachandran, Trivandrum. Sophisticated yet formal Kurtas that will definitely catch eyes. 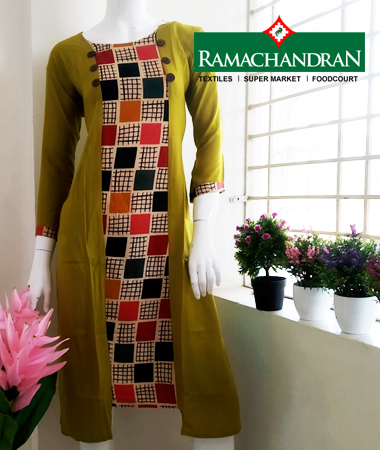 This kurta style includes a longer cut at one of the sides in the hemline of the kurta. The C cut at the bottom is something new and stylish. 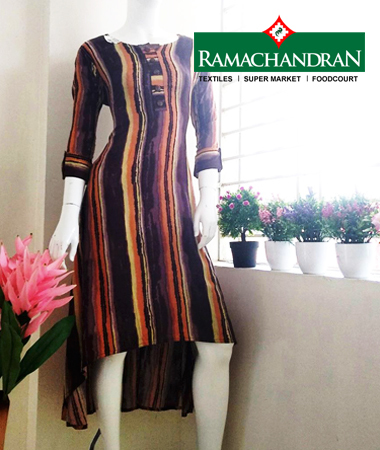 This long kurti will look great with cigarette pants or just leggings. This is fabulous collection for girls. Price range - 970 Rs to 3590 Rs. If you are having a perfect body shape, this dress is going to make you look better. It can be paired with flared lowers as well as with fitted pants like legging or jegging. 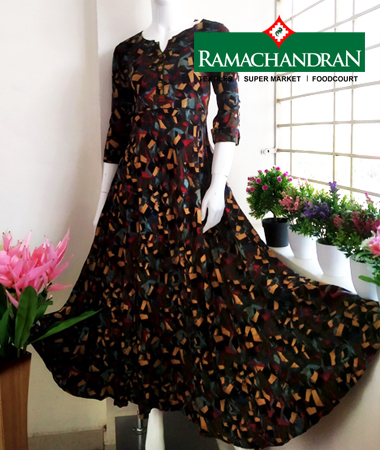 These Kurtis come with sufficient frills and gives a perfect ethnic look. Price range - 199 Rs to 2010 Rs. 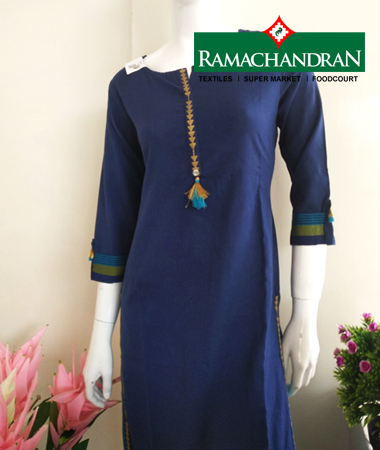 double layer kurta is a trending style which you need to have in your wardrobe. Usually it comes in two different colours which will be attractive and bold. Plain and simple, this beauty will be great for all occasions. This is useful to those women’s who are working in an office or in school, this is the best serious look and gives comfort to women’s too. Price range - 1099 Rs to 2250 Rs. 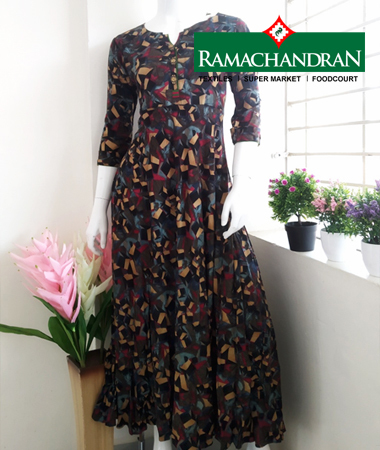 Flared kurtis are chic and elegant. Its designed in such a way that they swing both ways, Its quiet ideal for formal set-up or just as daily wear. The hemline opens up on both the sides, adding a little bounce to the outfit, and that’s what makes these attractive. Can be paired with leggings or jeggings. Price range - 1399 Rs to 3100 Rs. A commonly sought after style by youngsters! 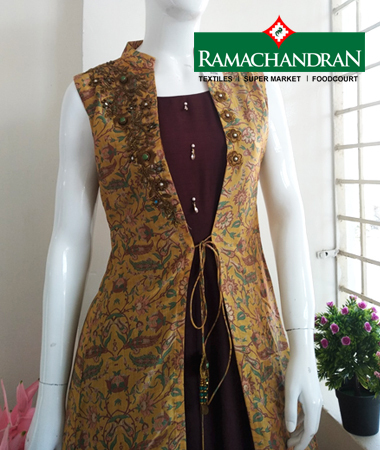 A jacketed kurti adds an interesting definition to your outfit and amps up your style instantly. It can actually pass off as a dress as well. Price range - 549 Rs to 6745 Rs. 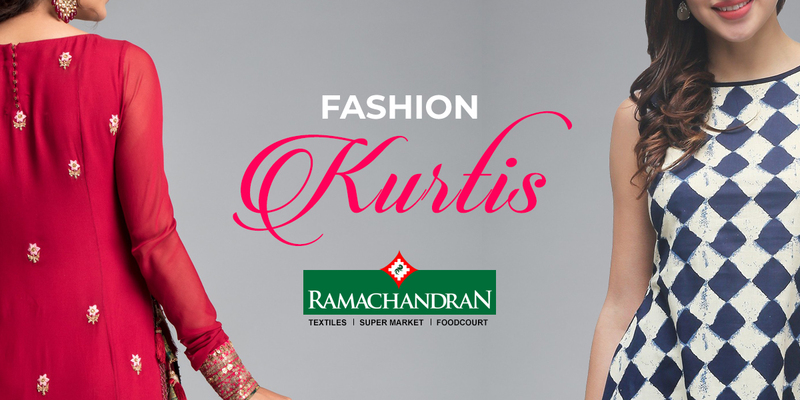 The shirt style kurtis come with shirt like collars with various lengths. 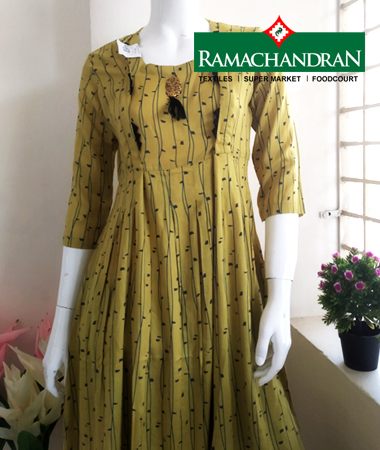 The shirt style kurtis can be described as a nice fusion of shirts and kurtis and due to the presence of formal shirt like collar these kurtis give a smart look and can be worn as a dress too. Price range - 299 Rs to 3595 Rs. As the name suggests it's a perfect combination of colours. I is also very comfortable to wear. Cold shoulder is the latest trend in fashion which everyone is following and it’s not just meant for the western clothing but the tradition ethnic ones have adopted this style too. 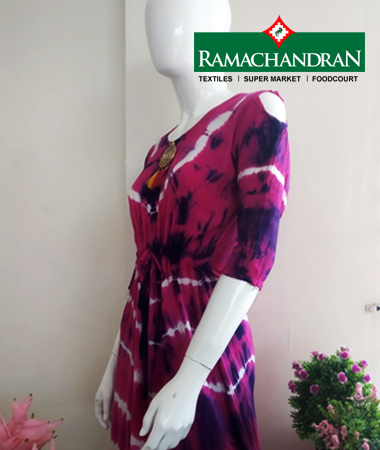 Try Cold shoulder kurtas or jackets for an extra pep to your garments. Price range - 499 Rs to 550 Rs. 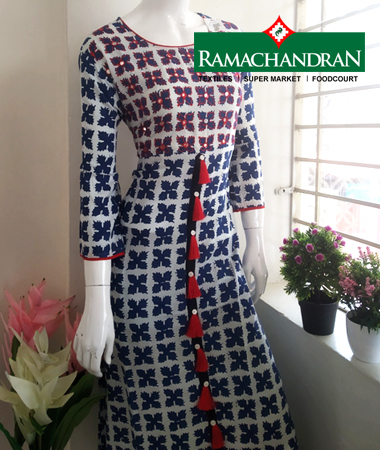 With lovely Indian print kurti with tassels in front that are made in contrasting colour. 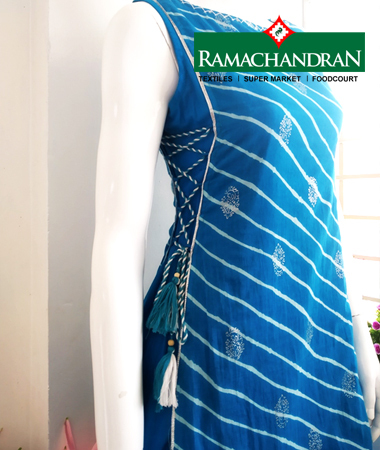 The tassels make the kurti look very elegant. Price range - 299 Rs to 1080 Rs. 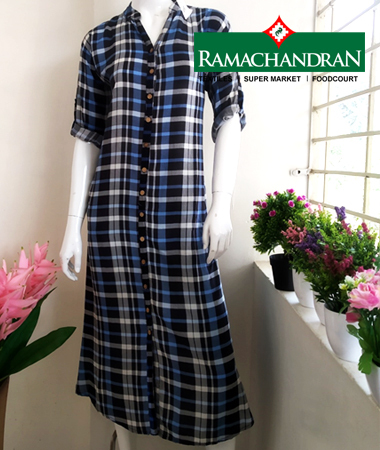 Long kurtis with a long slit was a trend setter! The slit is present either on one side or at the middle or on two sides. 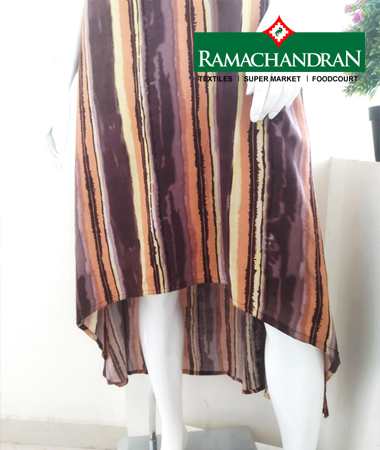 Often the long slit kurtis came with an inner layer, particularly if the slit is present at the middle front, but there were also front slit long kurtis that comes without a second layer. 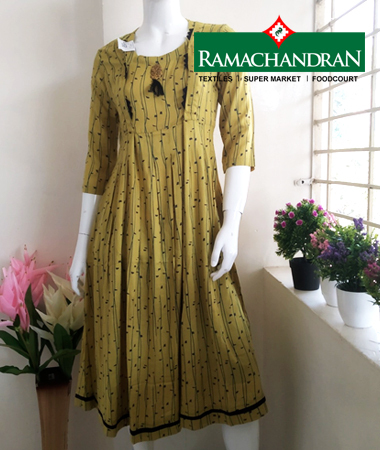 These kurtis looked stylish and were ideal for casual day outs and day time occasions. Can be paired with Palazzos for setting you apart from the crowd! Price range - 399 Rs to 849 Rs. 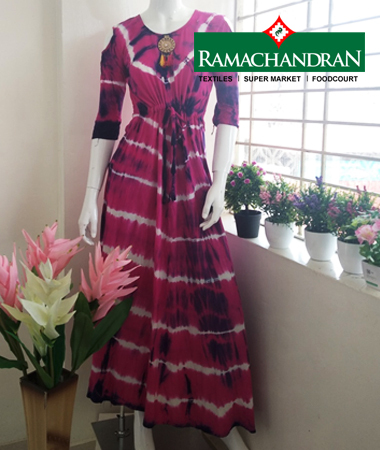 Enjoy the beautiful journey of motherhood with these types of kurtas. 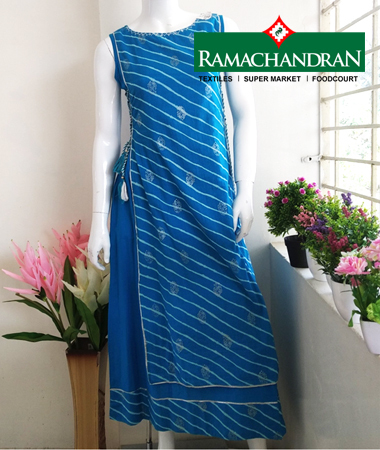 Maternity Kurtas are designed keeping your growing belly in mind. This range of pregnancy wear creates a perfect look for work, festival or casual outfit. Price range - 649 Rs to 11990 Rs. The love for this dress has never wavered. It is really formal and yet is having a specific style, in terms of looks and appearance. The ethnic outfit that does total justice to every woman's fast life. top choice of a woman irrespective of her age. The outfit has the versatility and looks great at traditional events. Price range - 299 Rs to 3000 Rs. Hemlines have gone asymmetrical with a boho flavour in 2018, and Indian wear too has adopted this global trend. 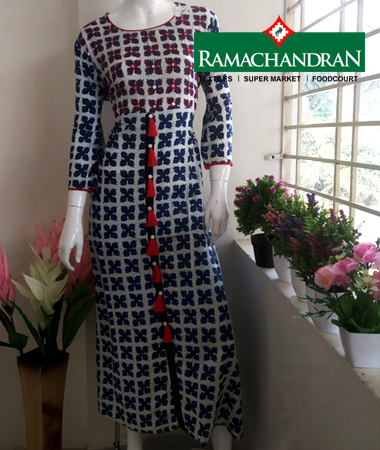 The interesting thing about asymmetrical kurtis is that you can wear it with just about anything underneath – straight pants, churidaars or leggings, palazzos or capris. Price range - 310 Rs to 2000 Rs.